My last dietetic internship rotation was considered my elective, and I chose to help with a research study looking at how food affects the way children eat. At the beginning of my rotation, I conducted phone screeners with parents that involved something called a 24-hour recall. Basically, I had parents tell me everything that their child had to eat and drink in the past 24 hours. Yesterday can feel like a really long time ago. It is very difficult to get adults to tell you what they ate yesterday, let alone get parents to remember everything their child ate, including portion sizes and amounts, brands, and times. The purpose of these diet recalls were to piece together and get a sense of the child’s usual dietary intake. This experience helped me learn a lot about the ins and outs of research study recruitment and how difficult it can be to measure how much someone is eating. The actual study takes place in two week cycles, where breakfast, lunch, dinner, and two snacks are provided to the children, and they have to do some computer games once a week to test their memory and attention. Just finished the first week of the first cycle, and boy have I been cooking up a storm with the other research assistants. We made this Cookie Dough Greek Yogurt for the kids this week and I can’t stop thinking about it. The “recipe” involves stirring sunflower seed butter, a little honey, vanilla, and chocolate chips into plain Greek yogurt. When I made it at home, I used a mix of chocolate chips and cocoa nibs. What a treat! Plus, it has enough protein, and a little healthy fat to keep you feeling satisfied and healthy. 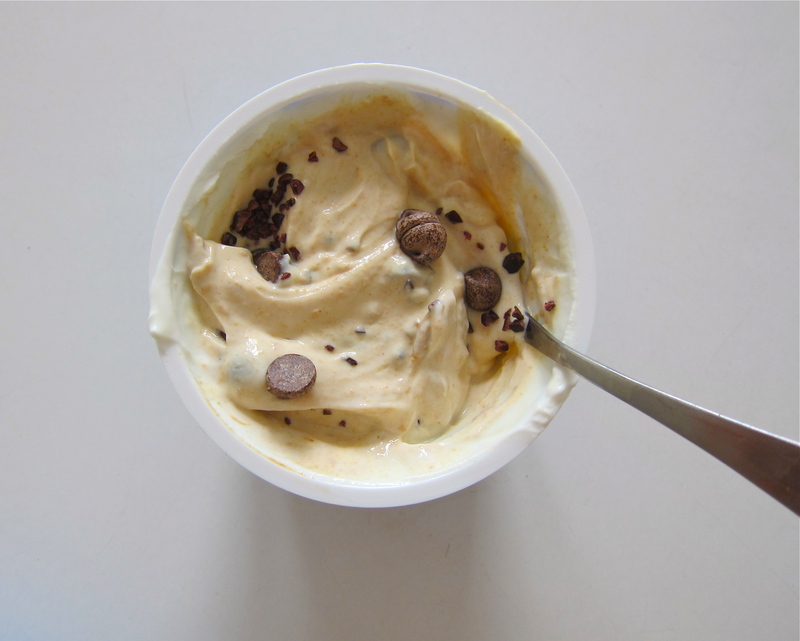 Cookie Dough Greek Yogurt. Great for breakfast, snack, or dessert. Stir together all ingredients. Enjoy! Beautiful! Looks so tasty, I like the Ben and Jerrys but this is much healthier! Congrats on completing your internship! So exciting!